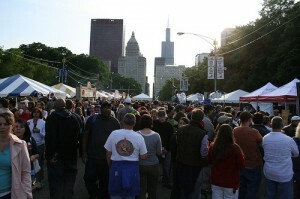 As Chicago weather warms up, the city becomes saturated with outdoor events and activities. From the Taste of Chicago, to the Blues Fest, to the Puerto Rican Day Parade, summers in Chicago are ripe with things to do. PR agencies around the city have clients who contribute sponsorships and have presence at some of these events. Many of FCG’s team members are out and about at various events with clients, doing tent activations, or even putting together grandiose soirees on behalf of the client. Know why you are putting on the event. I think that’s pretty straight-forward. It can be anything from introducing a new product, a networking event, or to celebrate a holiday, but be clear on the purpose of the event. Make a budget. You’ll likely have one lump sum to start with, but break it down and budget for the things you’ll need to put together for the event (i.e. signage, decorations, entertainment, photographers, food, etc.). Lists, lists, lists. I don’t know about you, but I live and die by lists! They definitely help when it comes to remembering details. And when planning an event, there WILL be details. Write down everything you’ll need to order, bring, put together, or have delivered. Write out timelines leading up to your event, contact info for necessary parties who will be at the event, and anything else you can think of. The more organized and detailed you can be, the better. Publicize the event. Depending on the size of the event, that could mean simply sending out invitations, or, on a bigger scale, it could mean a putting out a press release, developing a media strategy, pitching media about it, tweeting about it, and/or having a spokesperson talk about it. Just make sure to get the word out. You don’t want to plan for an event and have nobody show up because they didn’t know about it. Put together your on-site team. Again, depending on the size of the event, that could mean having one or two extra hands on-site to keep everything in order, or you might need bar-tenders, a wait staff, a street team, and some of your agency colleagues to make sure the clients are okay. Everyone should have clear direction on their roles and responsibilities so that they can show up and do what’s needed. You never want to be understaffed for an event. Execute! During event day, work your magic. Charm the attendees, (hopefully) impress the client, and ensure that everything runs smoothly and timely. Taking heed to some of these steps has helped FCG in putting together and participating in some great summer events. Hope to catch you at the next one!